Why now, in Space Year 2019, do we turn our attention to Sherlock Holmes, Sir Arthur Conan Doyle’s consulting detective from 1887? Well, mainly because I like him, but also because of Mickey Mouse. The latter will require some further explanation, the former, I trust doesn’t – the detective’s stories were popular from the outset, perhaps problematically so for Doyle, and have remained an iconic pillar of popular culture for well over a century. Part of the why of that enduring popularity brings us back to Disney, nearly. What brought Sherlock to mind was the recent addition in the US of A of the very earliest form of Mickey Mouse into the public domain. Surprising, as Disney have long fought tooth and nail for increasing copyright extension terms. Now, it’s not quote that clear cut – it’s not a recognisable form of Mickey Mouse, really, and there’s plenty of other ways for a company with near-infinite money and near-infinite lawyers to stymie anything they see as a threat. But, it did remind us of the value the public domain holds to culture as a whole, and Sherlock Holmes is a pretty solid example of this. Now, there are some caveats to this, involving storied legal battles of who actually held the rights to Conan’s estate which is an interesting tale – well, to me anyway -but these are outwith our scope. We can broadly say that the character of Holmes is now public domain, which opens up a lot of interesting takes on it, from plugging him into a quirky police procedural in Elementary, or turning him into Doctor Who in the Beeb’s Sherlock, and varied films such as Mr. Holmes, Guy Ritchie’s films, one of which, Game of Shadows we’ll speak of later, and the recent comedy Holmes & Watson, which no-one involved seems to want to speak of ever again. But there’s no shortage of more traditional adaptations through the years – particular shout-outs to the excellent ITV series with Jeremy Brett from the Eighties that was at least part of what drew me in to the character – but first off today we’re looking at an early entry in the series of WW2 era outings with the prosaically titled The Adventures of Sherlock Holmes. Basil Rathbone’s is perhaps the most famous incarnation of Sherlock Holmes, not surprisingly, I suppose, since he played the great detective in a series of 14 films in eight years, forever linking him with the role and the role with him. His second appearance as Doyle’s detective is perhaps the most well-known, and certainly amongst the most lasting in impact as it is Alfred L. Werker’s The Adventures of Sherlock Holmes that gave the world the immortal line “elementary, my dear Watson”. Based on William Gillette’s 1899 play Sherlock Holmes (though with apparently little resemblance, making “adaptation” a not entirely appropriate description), rather than directly on Arthur Conan Doyle’s writing, The Adventures of Sherlock Holmes nonetheless has many of the most familiar aspects of the stories, including a late Victorian London setting (no 1920s or Nazis here), Dr. Watson (played here as something of a buffoon by Nigel Bruce), housekeeper Mrs. Hudson (Mary Gordon) and Holmes’ nemesis, the Napoleon of crime, Professor Moriarty (George Zucco). The film begins with Holmes’ frustration at the devious Moriarty being acquitted of murder due to insufficient evidence, and Moriarty’s decision to manipulate Holmes and so occupy his brilliant, challenge-hungry mind that he will be entirely distracted from the true crime: stealing the Crown Jewels from the Tower of London (though personally I happen to consider murder a considerably graver offence then snaffling some polished rocks and shiny hats). To this end, Moriarty despatches Arthur Hohl’s offensively badly-accented Bassick to send a letter which causes much consternation and suspicion in the Brandon family, and leads to Ida Lupino’s Ann Brandon visiting Holmes and pleading for help. Holmes agrees to investigate, but things are complicated by the fact the man in charge of the security of the Crown Jewels has asked for the detective’s assistance at the same time. For all the reputation that this film had, and to a degree has, it’s alright, and nothing more, and I was actually pretty disappointed by it. 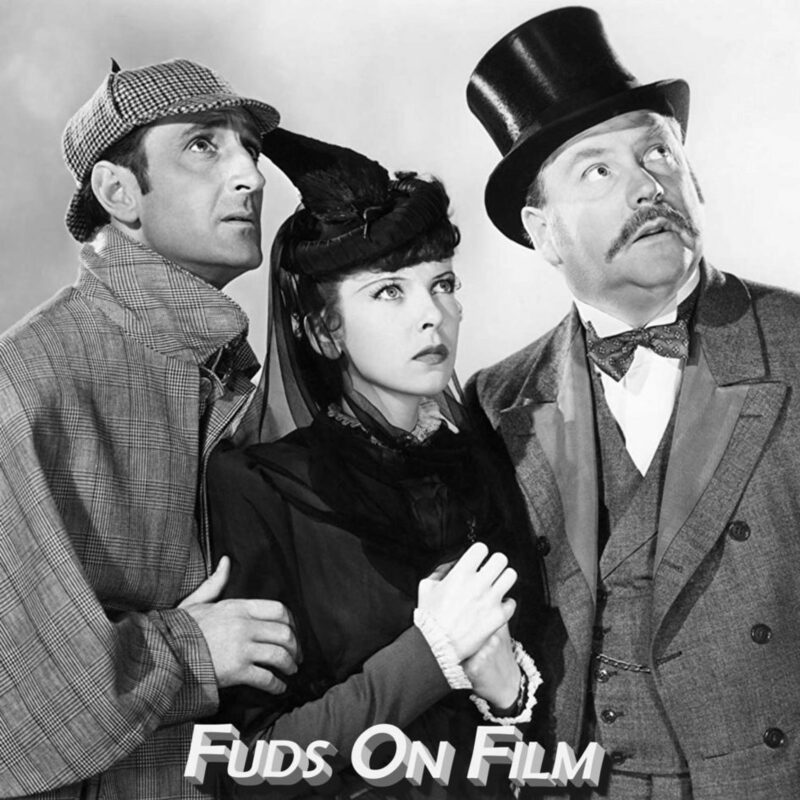 The pacing is brisk, it’s enjoyable enough for its 81 minutes, and Basil Rathbone is thoroughly entertaining (it’s no mystery why he became THE cinematic Sherlock Holmes, beyond mere repetition), but it’s pretty lightweight in terms of Holmes’ legendary abilities: aside from a sketch of a bird prompting a knowledge of avian anatomy and the subsequent investigation (which actually seemed wholly unnecessary when he could simply have said “looks like an albatross to me”) there’s little evidence of the deductive and reasoning abilities that are what made the character such a cultural touchstone, with most action being reactionary and simply following the clues in a way which any vaguely competent detective could have done. Moriarty is also frustratingly absent for much of the film, leaving much of the time to be filled wondering how Edward James Olmos went back in time to be cast as a South American hitman, and why Ida Lupino’s eyebrows seem to be extending almost to her ears (this last being something I was unable to take my eyes off of). Influential, perhaps, but disagreeably ordinary. So, back to that concept of different takes on the character, then. I’d hoped to revisit the first of the Guy Ritchie helmed Holmes takes alongside this, but time and information technology prevented that. However my recollection was that I much preferred this second entry anyway, despite the absence of hilarious Mark Strong wigs. Robert Downey Jr.’s Holmes intrudes upon the recently married bliss of Jude Law’s Dr. Watson when the pair become embroiled in the schemes of criminal mastermind Professor Moriarity, him again, here played by Jared Harris. While there is, of course, a plot, and a plot within that plot, as it’s a plot about plotting, this sentence has become so recursive that i need to take a breather. What I’m getting at is that there’s not a lot to be gained by giving you a blow by blow recap – Sherlock believes Moriarty is up to no good, Moriarty confirms this during a show of mutual respect for the other’s brilliance, and warns him to back off, lest inconveniences be visited upon him and the Watsons the same way they were visited upon Irene Adler, who I guess must have been Holmes’ love interest from the first film? I don’t remember, but the early doors fridging seems to provide Holmes with enough motivation to follow his nose on these schemes, eventually revealed to be of globe-spanning conflict puppeteering, and stop them. Along the way they’ll team up with Noomi Rapace’s fortune teller slash anarchist in search of her brother, and barrel through a Europe on the verge of war with Moriarty’s goons in hot pursuit, turning this into as much of an action film as a detective story. Well, a lot more of an action film than a detective story. Well, an action film. With slight detective overtones. Very slight. This came out to mixed reviews, but a fair amount of commercial success which is at least somewhat indicative of an audience thumbs up. I can see why this might not be to someone’s taste, but this is right up my alley. It is, frankly, ridiculous. Witness Holmes’ “urban camouflage” suits, in which he’s basically painting himself the same colour as the background. Laughable, but, well, that’s the point. It’s as much of a comedy as an action film with slight detective overtones. See also the evolution of Holmes’ omniscient detective vision that somehow gives him the foresight of Cassandra and the martial arts skills of Tony Jaa, to the point that he might as well be Neo off The Matrix. Congratulations, I suppose, to the filmmakers for making Bartitsu seem even sillier than it was in Doyle’s time. Speaking of which, while Guy Ritchie’s treatment here isn’t more or less influenced by Wachowskis’ film than any other post 2000 actioner, it does remind us of how long a shadow that film has cast. Ritchie throws a few curveball stylistics – particularly that bloke loading the large gun towards the end – but in general he’s put together a pacy, punch set of action sequences that’s an enjoyable ride. Still, that alone wouldn’t carry the film, but there’s some highly enjoyable dialogue threaded throughout the film, with likeable interplay between Downey Jr. and Law and a fine turn by Harris that’s villainous without chewing quite so much scenery as our other example spoken of today. Noomi Rapace is perhaps a little hard done by, but manages to inject a good amount of life into a character that deserves more screentime than she gets. It is so over the top as to have wandered into no-man’s land, but that’s exactly why I like it. It’s a Crank film with a Sherlock Holmes skin, and there’s nothing about that I don’t like. Apart from the absence of Jason Statham. I had intended to close out this review by bemoaning the untimely death of the franchise, but I see there a sequel planned for next year, which rather takes the wind out of those sails. Still, it does give me a reason to be very glad to watch Iron Man die in the next Avengers film.